Interactive 360-degree videos produced by DDA for Sandmeyer Steel Company takes viewers into the center of their exceptional stainless steel processing plant. Sandmeyer Steel, a global supplier and producer of stainless steel and nickel alloy plate, worked with Dynamic Digital Advertising to redesign and redevelop their website. Sandmeyer wanted potential and existing customers to take a unique glimpse into their operations, displaying their wide array of services and extensive inventory. Although a standard capabilities video is often effective, Sandmeyer wanted to take things a step further. They have had a long-standing relationship with Dynamic Digital Advertising and were also familiar with DDA’s video capabilities. Sandmeyer Steel wanted to give visitors of their site an experience that’s not only informational, but also engaging. DDA is familiar with Sandmeyer’s facilities, having taken photography and produced videos for them in the past. Through this, DDA suggested utilizing 360° interactive videos, which would not only offer a new perspective on the facility, but would also provide an interactive aspect to viewers. The 360° video footage would allow visitors to navigate through different parts of Sandmeyer’s operations, either by using their finger to swipe through in any direction or physically moving around their phone or tablet device. This gives viewers added interest and engagement of video motion and activity. Pre-shoot discussions with DDA and Sandmeyer were critical to make sure that as many plate processing machines as possible were captured while on-site. Action makes 360° camera footage more fascinating, so featuring lots of movement from the employees using the forklift and steel processing machines was important. DDA went on-site to Sandmeyer Steel to capture footage using their 360° camera. The various plate-processing stations throughout the inside warehouse made for ideal scenarios for this type of camera technology. As the machines were running, employees were walking back and forth, allowing the viewer to feel as if they are in the middle of the action. Many of the machines that Sandmeyer use are large and require distinct skill and safety protocols to operate them, but viewers don’t often see this aspect of plate processing this close. These 360° interactive videos give potential and existing customers a closer look at the quality and precision needed to produce high quality steel plate products. 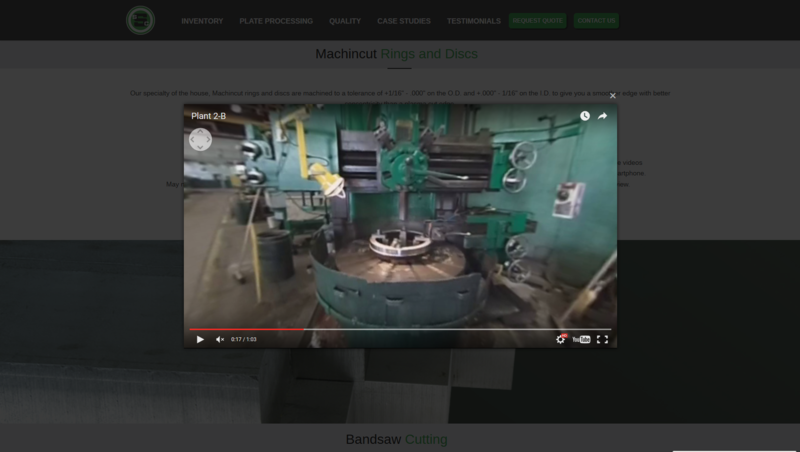 The four 360° interactive videos are integrated on Sandmeyer’s redesigned website, allowing viewers to take a new, closer look at steel plate production and processing.